Homeowners looking for a rich, authentic feel for their outdoor entertaining area will delight in our exotic Ipe wood decks and pressure-treated wood decks. Because wood is a renewable resource, our wood decks are 100% environmentally friendly. Not only that, they offer a resiliency that is hard to beat. Ipe wood is a tropical hardwood found in Central and South America. Similar to mahogany, Ipe is a beautiful reddish brown and has a tight grain, giving it consistent coloring. An Ipe wood deck will not splinter or absorb water, maintaining its shape and appearance for years. 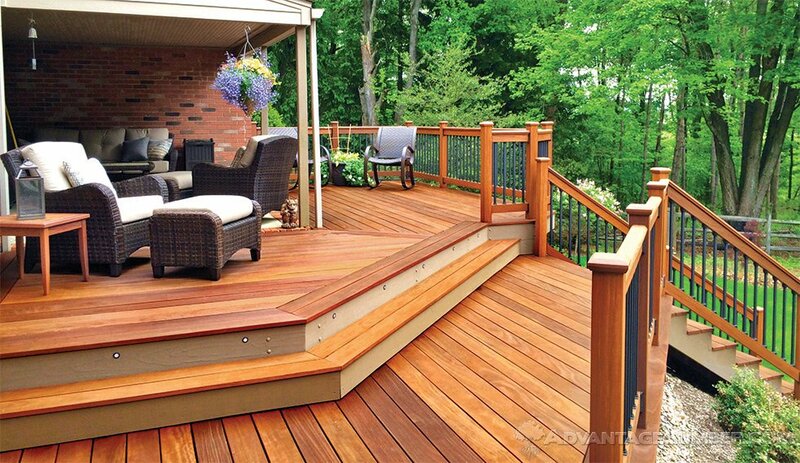 Our pressure-treated wood decks are constructed of pine for a handsome, timeless look. Our pressure-treated wood deck is immersed in a liquid preservative and then placed in a pressure chamber to force the chemicals into the wood fibers. The resulting wood deck is resistant to rot, decay, termite damage, and water damage. An Ipe wood deck is exponentially harder than a teak deck, making it the toughest wood deck on the market. Unlike other woods, Ipe naturally resists moisture, decay, and insect infestation. And, its Class A fire rating means it’s as fireproof as steel and concrete. Our Ipe wood decks are a rich, reddish-brown color by nature, and, left untreated, will take on a handsome gray patina over time. Both Ipe and pressure-treated pine decks can be stained to any color you wish, making them completely customizable.